Institute manager Kevin Deery wants his players to give him a selection headache by performing to their best in the final league game of the season, at Ballyclare Comrades, this Saturday (KO 3pm). The Drumahoe side face Comrades three times in the space of seven days and although this weekend’s game is effectively a ‘dead rubber’, Deery is expecting whatever team he chooses to have a point to prove. “I want to give players a fair opportunity at this stage of the season and I’m expecting them to play like men possessed, to stake their claim in the team for the play-off games against Ballyclare,” he said. “Look, if you go out and perform at a really high level then you won’t be over looked for the playoffs, so that will be the message to whoever starts the game this weekend. “The changes I’m probably going to make are because people haven’t played as many games as the boys who played at the PSNI, so we are giving players opportunities, it’s as simple as that. “Look every time you put on the jersey and go out to play, it’s an opportunity to show me how much you want it and if they play like ‘men possessed’ it would be very unfair of me not to pick them for the playoffs. One man who is likely to feature if he recovers from an ankle injury is ex-Ballinamallard United man Raymond Foy. 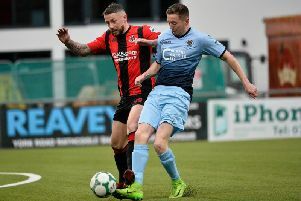 The midfielder picked up a knock during last week’s reserve game and Deery is hoping he returns to training this week and is available for selection this weekend. “Raymond tweaked his ankle a bit in the Reserve game in mid-week, so we decided to leave him out last weekend, but we are hoping he trains this week,” he added. Deery feels Comrades won’t want to face his side especially ahead of the two legged Championship playoff. “I think both teams obviously wouldn’t like to face one another the Saturday before the most important two games that you’re going to play,” admitted the ’Stute boss. “I’m not going to lie – the fact is we have to manage what’s right and do what will get the best out of the players this week. We have to pick a team that will always represent Institute and represent what I’m about. “It’s not going to be a matter of just going out and saying ‘forget about it’. There’s no chance. You can’t do that.